Affordable Housing Hudson held a forum on Thursday about the phenomenon of short-term rentals marketed through Airbnb and its impact on the availability of affordable housing in Hudson. Dan Udell was there to videotape the meeting, which went on for slightly more than ninety minutes. You can watch it all by clicking here. 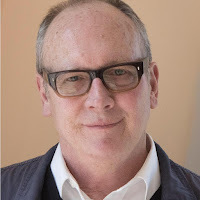 This morning, while driving around doing Saturday morning errands, I heard Scott Simon on NPR speaking with Reed Martin and Austin Tichenor of the Reduced Shakespeare Company about their book Pop-Up Shakespeare. By coincidence, when I got home, I had an email telling me about a different kind of pop-up Shakespeare happening here this afternoon. 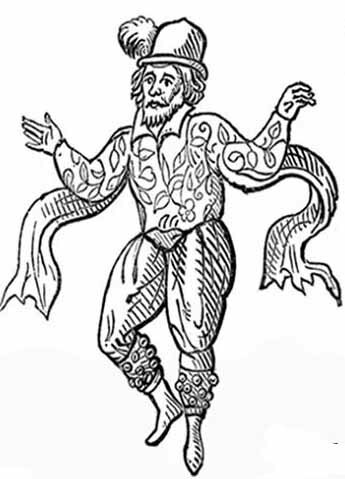 At 2 p.m., in Henry Hudson Riverfront Park, Will Kempe's Players from Troy will be performing Shakespeare's Twelfth Night, or What You Will. There's a suggested sliding scale donation of from $10 to $20. Be aware that this weekend is the last weekend during which alternate side of the street rules for overnight parking are suspended. Tonight and tomorrow night, it's OK to park overnight on either side of the street, but after October 1, it's back to alternate side of the street parking overnight every night, except for the nights before national holidays. 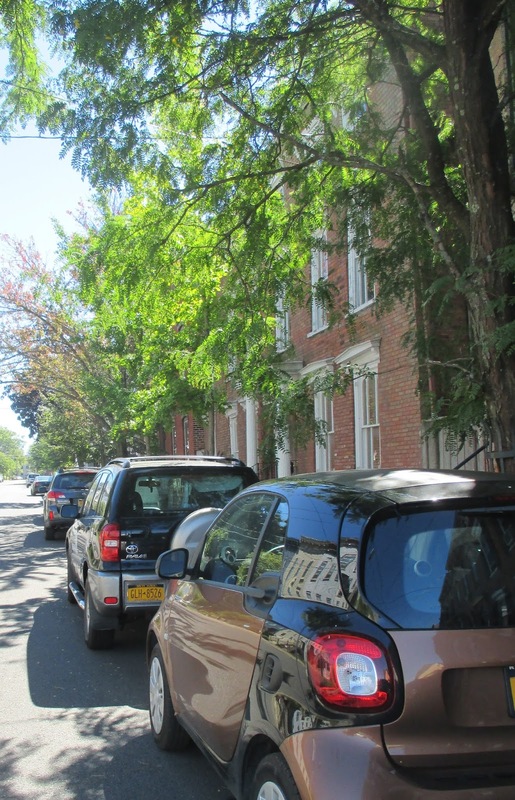 Just a reminder of how alternate side of the street parking works: It's in effect from midnight to 8 a.m., so if you are parking for the night before midnight, think of the next day's date. If it's an even number, park on the side of the street where the house numbers are even. If it's an odd number, park on the side of the street where the house numbers are odd. Last weekend, I heard the rumor that the trash barrel on the south side of Warren near Seventh Street had been removed because it was full too often, and the Department of Public Works, tired of emptying it, just took it away. The person who told me this did so with indignation and some conviction. I found the story hard to believe. I admit to being critical in the past about trash barrels being allowed to fill to overflowing on long holiday weekends, but I didn't think DPW would simply remove a trash barrel because it was filling up too often. So on Wednesday I went to the Common Council Public Works Committee meeting on purpose to ask DPW superintendent Rob Perry about the missing trash barrel. He told me that it had been removed because it was broken. Then, answering a question about graffiti on metal lids of the trash barrels, he explained that repairs to trash barrels were dealt with in the winter or early spring, when DPW workers, freed from mowing lawns, paving and patching streets, installing water mains, and other projects that can only be accomplished during mild weather, can devote their time to repairing trash barrels. Based on that, I didn't imagine the trash barrel at Warren and Seventh streets would be returned to service until April or May. But, lo and behold, driving by that corner late this afternoon, I noticed that the trash barrel was back. 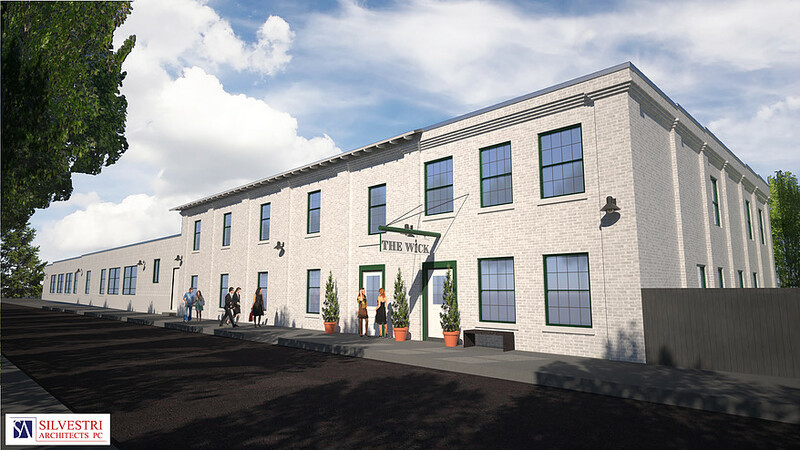 Tom Rossi, of Redburn Development, which is transforming an old industrial building near the train station and beside what was once South Bay into a hotel called The Wick, appeared at the Hudson Development Corporation meeting on Tuesday to make what seemed a simple request. Work on the hotel is expected to be completed in late October and a ribbon cutting is anticipated for early November. Redburn is replacing the sidewalk on front of the building, along Cross Street, with stamped concrete, to look like pavers, and to further improve the "sense of arrival" for the hotel, Rossi wants to demolish one section of the abandoned Kaz warehouse on the south side of the building. To illustrate the concern about a sense of arrival, these pictures show the hotel as it appears now to someone exiting the short-term parking lot at the train station. Granted from this vantage point there is a lot detracting from the sense of arrival, but from inside the hotel the biggest problem would be the abandoned warehouse, which intrudes on the view of the river and the mountains and detracts from "the experience you get from being in the hotel." The old Kaz warehouse buildings are owned by HDC, and HDC has been trying to market the site for redevelopment for a while now. The effort has been hampered by the need to acquire land from CSX that lies between the warehouses and South Front Street. 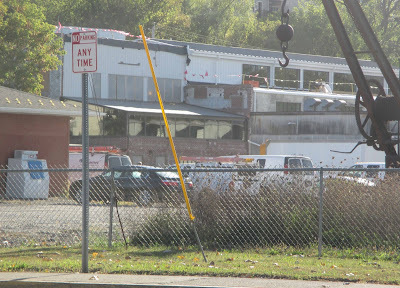 During Tuesday's meeting, before Rossi presented his request to demolish a section of the warehouse, Sheena Salvino, executive director of HDC, talked about this year's Restore NY money and suggested that the City apply for a Restore NY grant to demo Kaz. What Rossi proposed was that Redburn take down one section of the building and then build a wall to close off the remaining part of the building. 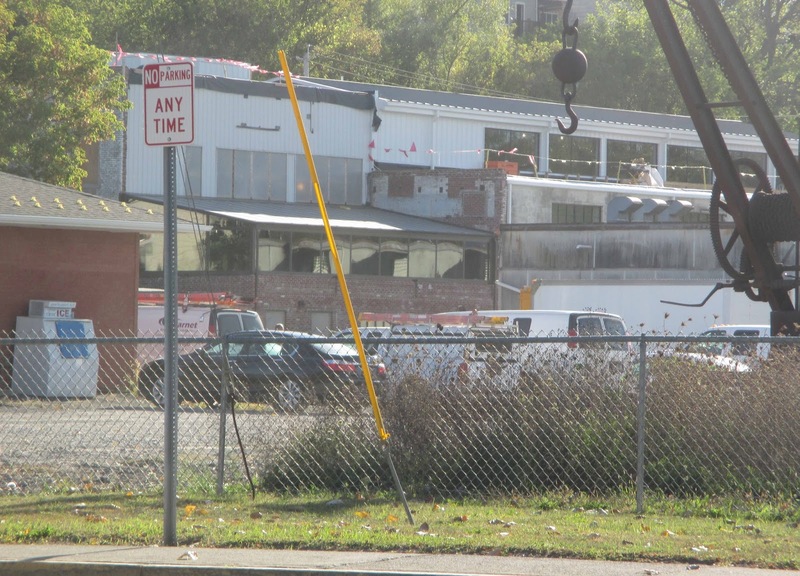 Redburn would pay the cost of the demolition and the wall, which is estimated will be $60,000. Responding to the request, HDC Board member Bob Rasner commented, "We should have been looking at this idea a long time ago," and went on to talk about the pressure of having to make a last minute decision, since the hotel is set to open in about a month. Rossi acknowledged the problem, telling Rasner, "I totally should have done this sooner." This exchange seemed puzzling, since Gossips reported nine months ago, in January 2017, that Rossi had told the Common Council Economic Development Committee he wanted to see the Kaz warehouse buildings demolished before the hotel opened and indicated that Redburn Development had offered to pay for a partial demolition of the buildings. At the end of their meeting, the HDC Board went into an executive session, which lasted for a very long time, to discuss Rossi's request. When the executive session was finally over, Rossi was told that Salvino would provide a list of questions about the details of the proposed demolition and wall, which Rossi was to answer in writing before October 6. On October 10, at 1 p.m., there will be a special meeting of the board to decide on whether or not to grant Rossi's request. 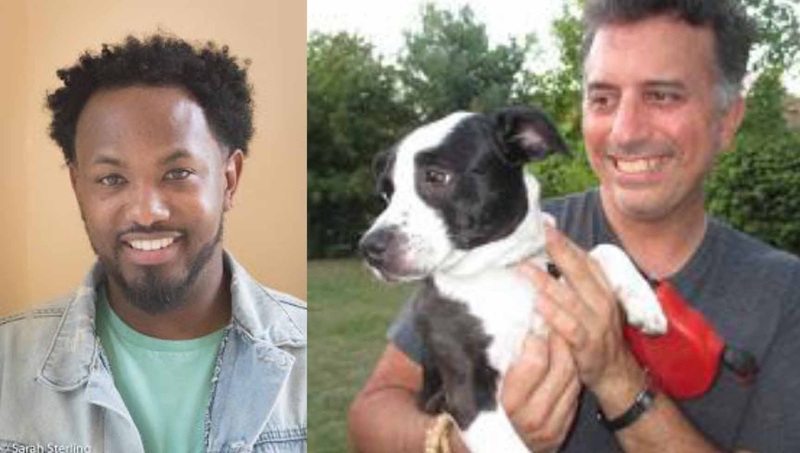 Earlier this week, Justin Weaver and Holly Tanner interviewed two alderman candidates on WGXC's Something to Talk About: Kamal Johnson (First Ward) and Rich Volo (Fourth Ward). Johnson won the Democratic primary on September 12 and is now running unopposed for one of the two First Ward alderman seats, with cross endorsements from the Republican, Conservative, and Working Families parties. The other candidate running unopposed in the First Ward is Rob Bujan, who won the Democratic primary and is cross-endorsed by the Republican, Conservative, and Independence parties. Volo won the Democratic primary but is still in a three-way race for the two Fourth Ward alderman seats. He and John Rosenthal won the Democratic primary and are the two candidates on the Democratic line, but Lauren Scalera, who lost the Democratic primary, will still be on the ballot on the Republican and the Conservative lines. Click here to listen. The interview with Johnson comes first; the interview with Volo begins at around 36:30. 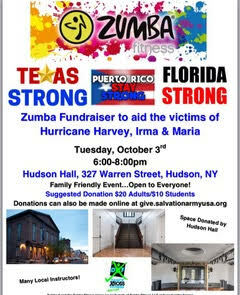 On Tuesday, October 3, there is a Zumba event at the Hudson Opera House to raise money to aid the victims of hurricanes Harvey, Irma, and Maria in Texas, Florida, and Puerto Rico. The event, which is open to all and is family friendly, takes place from 6 to 8 p.m. Suggested donations are $20 for adults and $10 for students. The money raised will go to the Salvation Army Hurricane Relief Effort. 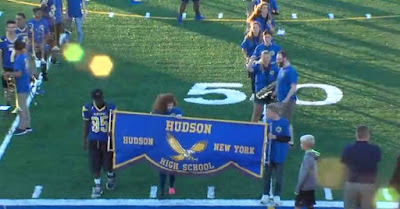 For those who only heard sounds of fireworks but didn't know the reason for celebration on a Thursday night, Lance Wheeler's video, capturing the highlights of last night's ribbon-cutting celebration at the new Bluehawk Sports Complex at Hudson High School, can be viewed by clicking here. This morning, heading down to the waterfront with Joey in the car, I saw Melissa Auf der Maur standing in front of her house with a dog. I knew she didn't have a dog, so when I saw that the dog was not on a leash, I stopped. She told me she thought the dog was lost, but he was wearing a collar with an ID tag. It became our goal to get close enough to read the tag and reunite the dog with his people. Melissa confessed inexperience and some uneasiness with dogs, so I parked the car, leaving my dog inside, and took up the pursuit. I called to the dog, in the way that brings Joey running to me at the dog park, but to no avail. The dog stopped and looked at me but then turned and continued walking down Allen Street. At one point, he crossed the street to where Mark Lacoy was getting out of his car. He showed interest in Mark, and Mark was willing to help. We tried to lure him closer with a bit of Mark's breakfast, but the dog snatched the offering and walked away. Mark then took up the pursuit, while I went back to retrieve my car and Joey and then catch up with the action. It was decided we needed a leash, so I took Joey's leash, which totally confused my poor, patient dog, who was ready for his morning walk. When the dog we were pursuing made a right turn in front of the Half Moon, Mark, leash in hand, cut behind buildings and caught up with him at the corner of Front and Partition. When I arrived on the scene, Mark had the dog on the leash. 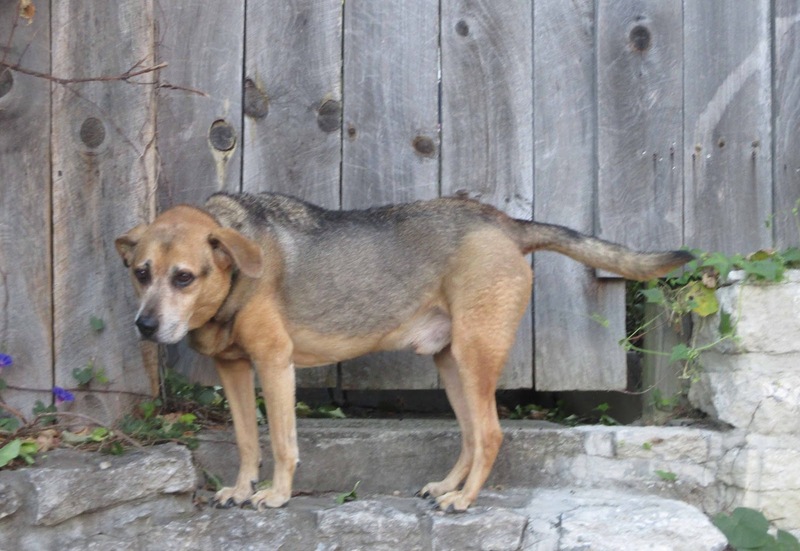 It seems the dog wasn't happy about a stranger snapping a leash to his collar and yelped in protest, which brought Bob Mechling out of his yard onto Partition Street to see what was going on. He identified the dog as Sawyer and explained that Sawyer often took himself on little unaccompanied walks around the neighborhood. He then went to tell Sawyer's humans that their dog and his "rescuers" were at the back gate. 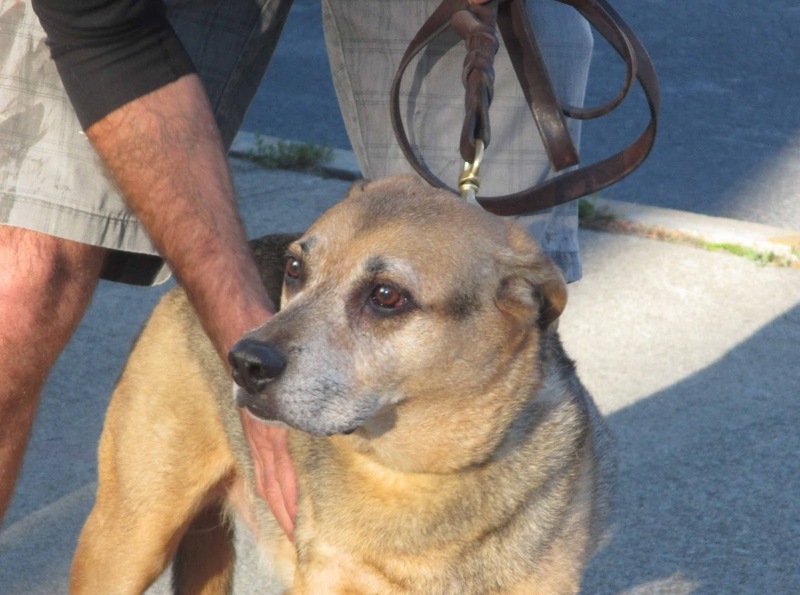 When Sawyer's human opened the gate to let Sawyer in, he seemed neither relieved to see his dog nor grateful to the helpful neighbors who had delivered him back home. In fact, he seemed singularly annoyed. This little story should probably have been called: "Neighbors Helping Neighbors . . . Whether They Like It or Not." I learned a new acronym on Tuesday, one apparently that has been used for years to describe the modus operandi of the Department of Transportation: DAD, which stands for Decide, Announce, Defend. The long awaited public meeting about the stabilization of the escarpment took place on Tuesday, but the people who filled City Hall were surprised and disappointed by the format of the meeting. Thomas McIntyre, Assistant Commissioner of Transportation for New York State, started out by saying he and other representatives of the Department of Transportation and Amtrak were there to answer questions but then asked that questions be held until the end. 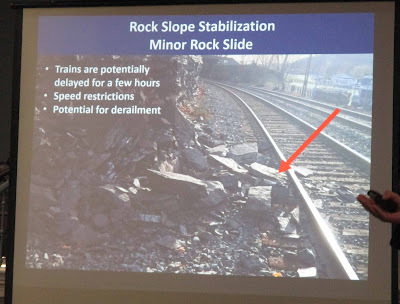 After stressing that work on the escarpment was a safety project and a "top priority because of the hazard of falling rock," McIntyre introduced a project manager from Amtrak who talked about the close proximity of the rock to the tracks, the limited sight distance, evidence of an ancient fault, stress cracks that could turn into rock falls, the 1.3 million passengers that travel the Hudson River Line every year, and raised the specter of a slope failure. He then displayed a picture of a minor rock slide that occurred on this stretch of tracks in November 2016. 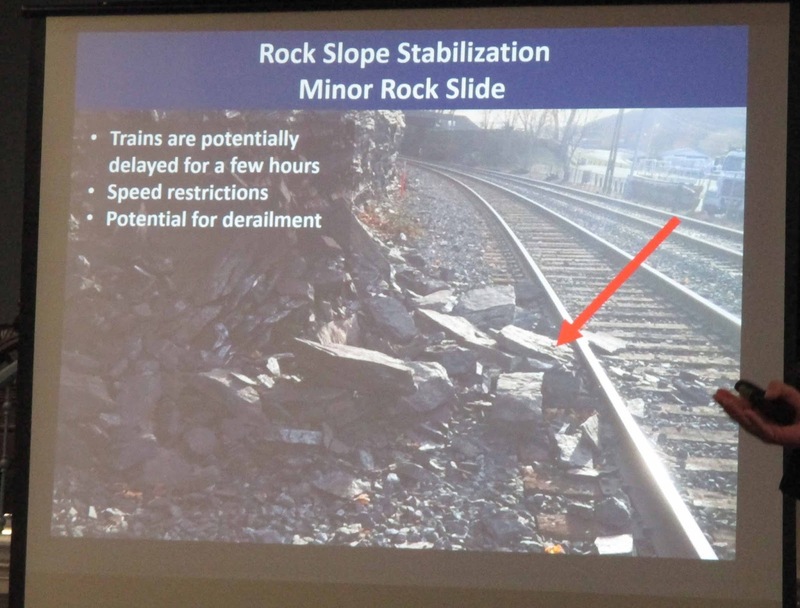 After talking about a rock slide in Northfield, Vermont, that caused a derailment and resulted in seven people being injured, $10.2 million in damage, and several days of no service, he declared that "Hudson has become the highest slope stabilization priority." Presentation over, audience members were told they could come up individually to make comments and ask questions of the DOT and Amtrak staff present. There would be no public discussion. They could also submit comments about the "Hudson Slope Stabilization Project," before October 11, to mark.jakubiak@dot.ny.gov. This was not received well. Members of the audience objected that they had not been presented with alternatives but rather the rationale behind a fait accompli. 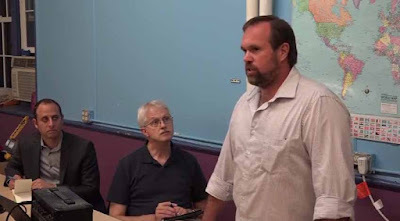 Jeff Anzevino, land use advocacy director for Scenic Hudson, objected that he had heard nothing in the presentation about compliance with the Department of State's coastal management policy. He also asserted that "the way this was presented raises issues about how conclusions were reached." Alan Neumann, president of Historic Hudson, asked if anyone had thought of moving the tracks closer to the river. He then contended, "I'm not convinced this is solving the underlying problem. This could exacerbate the problem." Scenic Hudson is equally disappointed that the project was not described in its context of its location adjacent to Promenade Hill Park--one of America's oldest municipal parks--and the Front Street-Parade Hill-Lower Warren Street Historic District. 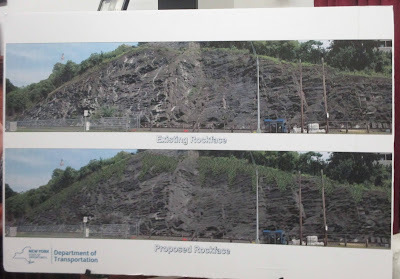 In addition DOT staff made no mention of the need for a NYS Department of State (DOS) determination that the work to be conducted to stabilize the rock slope would be consistent with New York State's coastal policies as they relate to the protection of scenic and historic resources. . . . While Scenic Hudson agrees that safety is a high priority, the potential for adverse impacts on New York State's Coastal Zone, Hudson's waterfront and its historic district also merits consideration when addressing the safety issue. 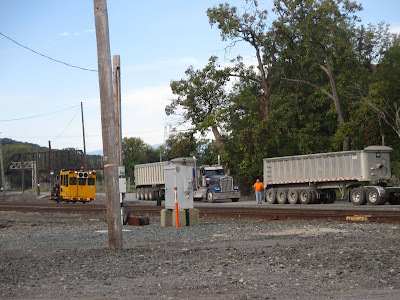 At the meeting Anzevino also urged the DOT to engage municipal officials and the public early in the process when subsequent rock stabilization projects are planned in nearby Stockport and Germantown, as well as other locations along the Empire Corridor. The public process must be conducted before decisions are made in order to avoid the outpouring of concern that people expressed in Hudson. 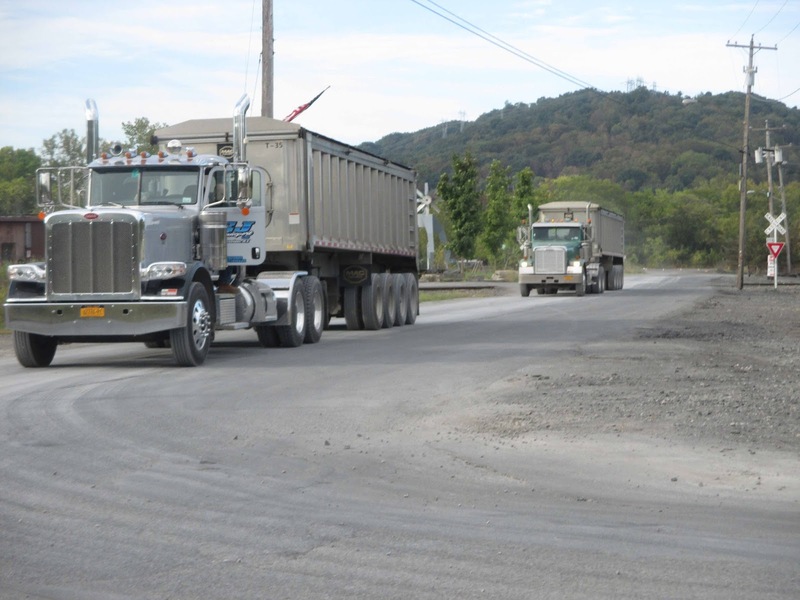 Readers are urged to submit comments about the rock stabilization to the Department of Transportation (mark.jakubiak@dot.ny.gov) and also to the Department of State. Comments to the DOS can be submitted here. It's public notice F-2017-0797. 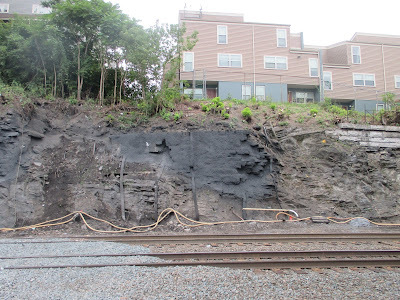 Because the rock stabilization project involves Amtrak, a federal agency, the DOS must make a formal determination that the work is consistent with New York State's Coastal Policies, which include, among other things, the protection of scenic views and historic sites. Comments are due by October 11. 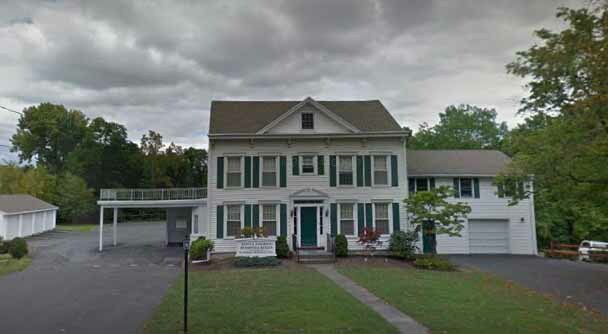 Bill Williams at 98.5 The Cat is reporting that the Hudson Police Department and other law enforcement agencies responded this evening to a "large fight" that broke out at Bates & Anderson Funeral Home on Green Street: "Melee breaks out at Hudson Funeral Home." Someone must have spread the word that Monday night's regular Common Council Police Committee meeting was going to be a "community meeting" about the recent violence in Hudson, and that brought a reporter from Channel 6 News to the meeting. Her report appeared online the next day: "Hudson PD holds community meeting following recent shootings." Amanda Purcell from the Register-Star was also there, and her report appears online today: "Hudson police face questions from the public about the shootings." The meeting was in fact a regular Police Committee meeting, always open to the public but rarely well attended unless something is happening that makes people outraged and upset, so before questions and comments were heard from frightened neighbors and the angry grandmothers of victims and near victims, Chief Ed Moore presented his quarterly report to the committee, with charts that compared police activity for the first three quarters of the year for the past three years: overtime hours; calls for service--crimes against property; calls for service--crimes against persons. 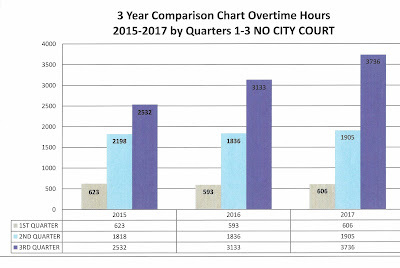 The charts show there's been a significant spike in overtime. Moore noted that the amount spent so far in 2017 on overtime equaled the cost of a new police vehicle. 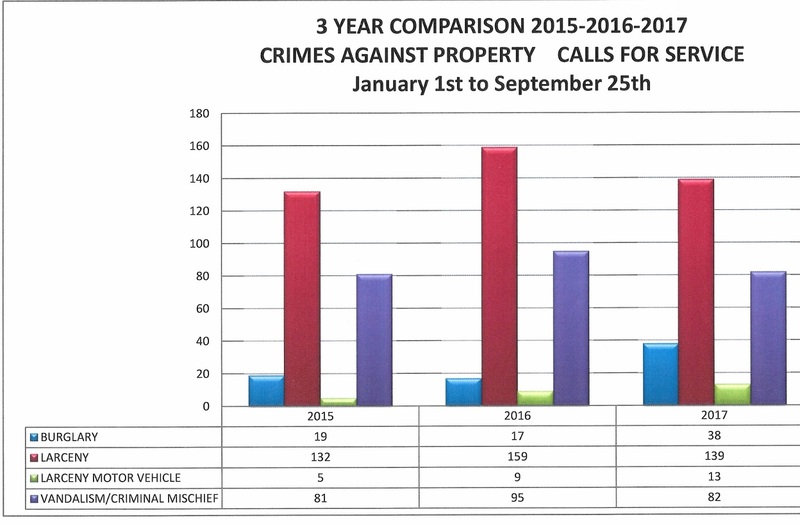 This year has also seen a drop in larceny but an increase in burglaries and assaults against persons, including one murder. At the heart of the overtime issue--aside from the HPD having to work overtime investigating the spate of violence in the city--is the fact that the department is currently understaffed. The force had been capped at 26, but in the 2017 budget, the salary for a 26th officer was eliminated. 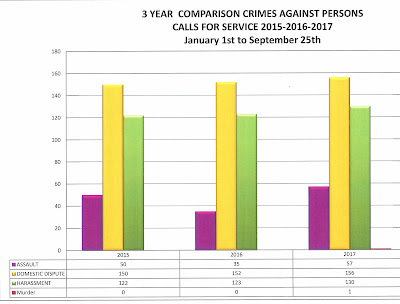 That combined with the loss during the year of four or five officers--most to retirement, one to long-term disability--meant that for much of the year the HPD was working without a full complement of officers. Two new officers have been hired recently--Randy Strattman and Jen Keyser--and Moore is working to get the department back to 25 officers. He has requested that the 26th officer be put back in the budget and is seeking community support for that. The lack of staff is also cited as the reason the HPD cannot engage in community policing--something brought up by both neighbors to the violence and relatives of the victims. Moore explained that, with the current shortage of officers, "it is almost impossible to devote officers to community policing." "We cannot have people walking," Moore told the group, "until we are fully staffed." On a brighter note, Moore told the committee that, without the new police facility, "the investigation we are doing now could not have been done." He spoke in particular about the conference rooms in the new police station and the ability to get a lot of officers together in one place for updates and meetings. He also praised the new contract with the police union which allowed him greater flexibility in scheduling officers, to ensure an adequate number of police officers were on duty on days and at times of greatest need. He noted that under the previous contract there might be as many officers on duty on a Tuesday morning as on a Saturday night. In the question-and-answer period, an issue first discussed a year ago returned: the problem of the "disorderly house." John Grayzel, a resident of North Fifth Street, who said his specialty was international development, made the point that "a crime against the community is worse than a crime against property" and characterized a disorderly premises--one where disruptive people congregate and represent a nuisance and a danger to the neighborhood--as a crime against community. He asked, "Do the police have adequate laws?" The question recalls the discussion last October about Chapter 188, Paragraph 5 of the city code: "Keeping disorderly house prohibited." § 188-5. No person shall, within the limits of the City, keep or maintain a disorderly house or a house of ill fame or allow or permit any house, shop, store, or other building or structure owned or occupied by him or by her to be used as a disorderly house or house of ill fame. The police had been applying this law to situations that involved people hanging out at a house or apartment, creating noise and objectionable activity and disrupting the neighborhood, until it was pointed out, probably by a defense attorney, that the term disorderly house had a very specific meaning: brothel. A year ago, Moore asked the Common Council to rewrite the law so it would apply to situations that actually exist today. The Common Council Legal Committee, on the recommendation of city attorney Ken Dow, decided to go beyond amending a single statute to take on the task of reviewing the entire city code to identify other arcane or problematic laws and recommend amendments, but the project never seemed to be pursued. Perhaps the Legal Committee will return to the issue now and propose a simple amendment to § 188-5. In August, Gossips reported the rumor that Anthony Laulette, executive director of the Hudson Housing Authority, had resigned after only five months in the job. Gossips was able to confirm this was true but could not discover the reason for his abrupt departure. According to an HHA board member, Laulette cited only "personal reasons" when he presented his resignation to the board. Laulette did not respond to Gossips' query. Today, at the monthly meeting of the Hudson Development Corporation, executive director Sheena Salvino mentioned she had met the new executive director of HHA: Timothy M. Mattice, who most recently worked as executive director of the Gloversville Housing Authority. 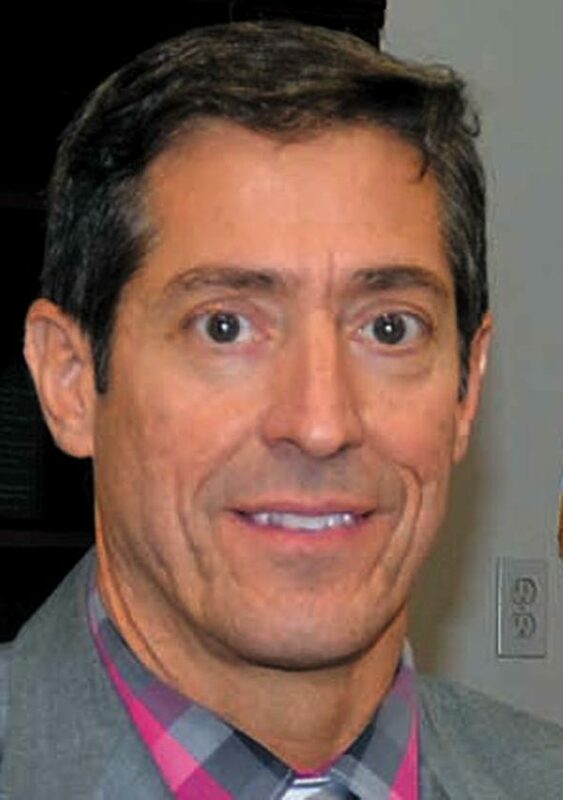 A little online research revealed that Mattice took the job in Gloversville in June 2015, succeeding someone who had held the position for more than thirty years. At the time, Mattice, who is in his 50s, was quoted in the local newspaper as saying, "I'm looking to end my career here. My passion has always been housing and I'm looking forward to putting my experience and expertise to use in the city that I've lived my entire life. I have a big commitment and passion for this city." Newspaper accounts, readily found on the internet, suggest that things didn't go exactly as anticipated. On January 12, 2017, the Fulton County Express reported: "The executive director of the Gloversville Housing Authority recently came under fire after nine employees filed a letter stating Tim Mattice has created a hostile work environment and has been using the authorities [sic] services improperly." The article doesn't specify exactly what Mattice had done to create a hostile work environment, but it does include the following quote from the letter of complaint: "He has created a severely hostile environment within the work place that has made each and every one of us anxious about our jobs and dread coming into work every day. In fact, some of us have even cried coming into work because of how hostile of an environment he has created." The article does explain the alleged misuse of the authority's services. According to the article, Mattice was accused of using housing authority personnel to do work for Gloversville Housing and Neighborhood Improvement Corporation, a not-for-profit for which Mattice was the executive director up until January 4, 2017, when he resigned from that position. On July 21, 2017, the Leader-Herald reported: "The Gloversville Housing Authority Board of Commissioners put its executive director and one employee on paid administrative leave and two commissioners resigned during a tense, five minute exchange on Thursday." According to the article, the resolution that put Mattice on paid administrative leave "for an unspecified amount of time" met with applause from the thirty people in the audience, who had waited through an executive session that lasted for three hours. One of the board members who resigned during the shakeup said he didn't think Mattice had done anything wrong, indeed he said Mattice had "only done good for this entire organization." He went on to say he thought "the residents wanted Mattice gone because he was trying to get rid of bedbugs." No articles could be found reporting what Mattice has been doing in the two months since July 21, but clearly he's been looking for a new job, and he's been successful. He is now the executive director of the Hudson Housing Authority, a job that entails the care and keeping and management of Bliss Towers. 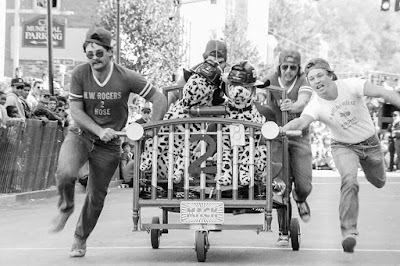 It's not often that life offers you a second chance, but if you couldn't get it together to organize a team and rig up a bed for the 2017 Hudson Bed Races, you are getting a rare second chance, so don't squander it. Originally scheduled for Saturday, September 23, the bed races, a grand Hudson tradition which made a comeback in 2016 after some thirty years, had to be rescheduled because, remarkably, unthinkably, only one bed had been registered for the race. The new date is Saturday, October 21, a date that promises crisp and bracing weather for running down Front Street and gives you three long weeks to coerce your friends, outfit your bed, and get ready to be part of this bizarre competition. Think of it as your duty to keep a wacky Hudson tradition alive. If at least six beds don't sign up, the Hudson Bed Races may just go away for another thirty years. Many people in Hudson want more public green space but balk when the question arises of who will maintain those public spaces. The maintenance of our existing parks is woefully inadequate. From trees dying and not being replaced to insensitive pruning of hedges and shrubs to unsightly repairs to walks to alterations and additions undertaken without proper oversight, there's much that could be done better. 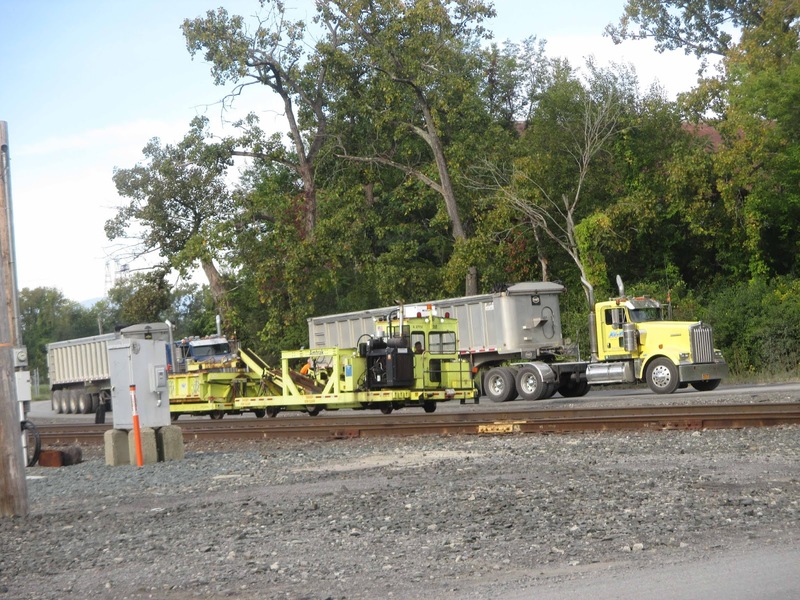 The Department of Public Works, whose job it is to maintain the parks, has its hands full with the City's critical infrastructure--collecting the trash, maintaining the water and sewer systems, keeping the streets in good repair and traversable. In addition to being fully engaged just keeping the city running, DPW crews, as DPW superintendent Rob Perry has acknowledged on more than one occasion, lack the expertise required to keep the parks artfully manicured and beautiful. Enter the Mrs. Greenthumbs Hedge Fund. For the past few years, a half-dozen people--Joe Connelly, Mara Estribou, Sarah Sterling, Ellen Thurston, David Voorhees, and Gossips--have been organizing biennial garden tours in Hudson, in honor of Hudson's most famous gardener, Cassandra Danz, a.k.a. Mrs. Greenthumbs. There were tours in 2014 and 2016, and there will be another in 2018. Donations from "garden tourists" and contributions from other sources built a little nest egg, which the group has dubbed the "Mrs. Greenthumbs Hedge Fund." The purpose of the fund is "to enhance and maintain Hudson's public parks." In pursuit of that mission, the Mrs. Greenthumbs Hedge Fund provided the money to hire a landscape architect to design a ramp for universal access to Promenade Hill when it seemed that a $20,000 temporary ramp—which based on information available hardly promised to be an enhancement—was likely to be installed there. Now the folks behind the Mrs. Greenthumbs Hedge Fund are looking to broaden their effectiveness, and, toward that end, they are seeking guidance from the community. One idea being considered is to morph the small, informal group into a full-blown Hudson Parks Conservancy, taking as its model the Central Park Conservancy, the not-for-profit that raises 75 percent of the annual budget for maintaining Central Park and is responsible for the work required to keep the park beautiful. The Hedge Fund currently has a little money--a few thousand dollars--that could serve as seed money for such a non-profit. 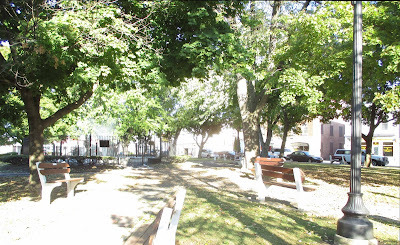 If you are interested in having a Parks Conservancy in Hudson and want to be a part of it, or if you have specific projects you would like to see undertaken to improve the City's public parks and open spaces, please let it be known either in a comment on this post (you'll need to identify yourself so we can follow up with you) or in an email to Gossips. If enough people show interest, the next step will be to bring everyone together to explore the possibility further. At the Common Council Economic Development Committee meeting last Thursday, several things of interest were discussed and decided. First, the committee voted to move ahead with establishing conditions for acquiring property at the next tax foreclosure auction, which is expected to happen sometime next month. To prevent people from buying property and warehousing it, a condition of the sale would be that the property have a certificate of occupancy and be returned to active use within 24 months. The resolution is expected to be presented to the full Council in October. The committee also voted to move ahead with legislation that would prohibit formula retail sales and service businesses--in other words, big box stores and chains--from locating in the City of Hudson. The intent of the law is stated in its title: "A Local Law to Preserve Community Character, Local Business Ownership, and Local Wealth." The exceptions recognized in the draft law are: "(a) federally or New York State chartered banking, savings and loan, and trust institutions, (b) pharmacies and drug stores, (c) stores where the overwhelming majority of the foods sold are un- or minimally-processed and intended for preparation and consumption by the purchaser at another location [in other words, supermarkets], and convenience stores that also sell gasoline." 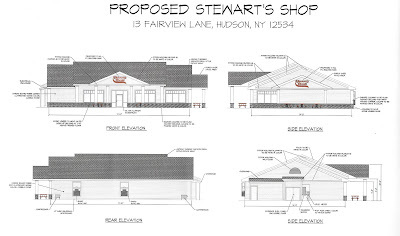 Although Stewart's Shops, being a convenience store that also sells gasoline, would be exempt from the proposed legislation banning formula businesses, the committee also decided that they would not pursue a zoning change to allow Stewart's to demolish two houses and expand their gas station and store at the corner of Green Street and Fairview Avenue. As Alderman John Friedman (Third Ward), who chairs the committee, explained, "Nobody in the neighborhood wants to see the expansion happen." He did note, however, that everyone wants to see the intersection improved, although it's not clear how that improvement might be achieved. Also of interest, and related to the first item about conditions for the sale of foreclosed property, some months ago the Economic Development Committee was looking at a draft resolution that would place conditions having to do with future use on the sale of 427 and 429 Warren Street, the former police and court buildings. Now it seems that, despite a Council resolution committing the City to using the income from the sale of these two buildings to pay down the debt incurred in creating the new police and court building, there is thought of keeping 427 Warren Street, the much maligned building alleged to have serious mold issues, and using it for the code enforcement office, which would be homeless were the two buildings to be sold. The sale of 429 Warren Street, the 19th-century building where the code enforcement office is currently located, could go forward. 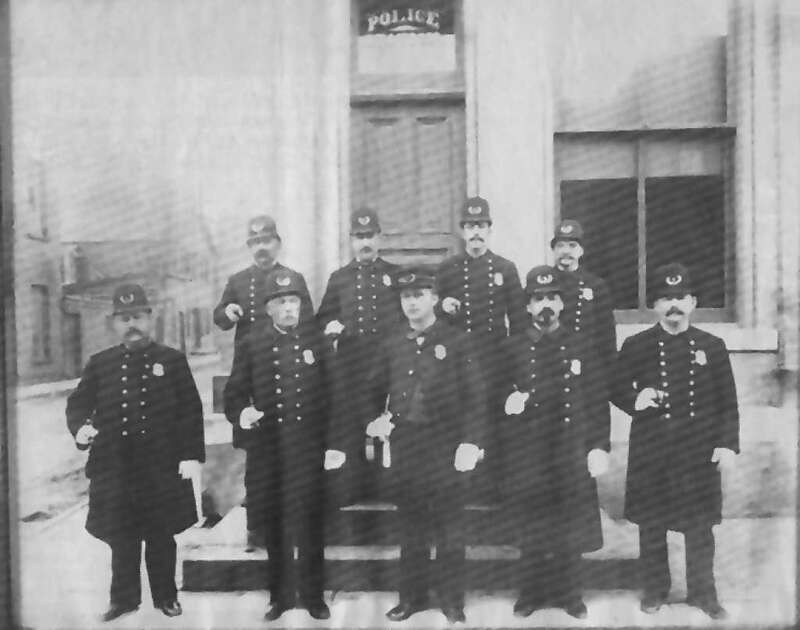 It should be noted that six months have passed since the police department and the court moved to their new digs at 701 Union Street. The Common Council Police Committee meeting takes place at 6:00 p.m. at City Hall. It's an opportunity to hear from Chief Ed Moore about the recent spate of shootings and burglaries in Hudson. At 5:30 p.m. at City Hall there is an informational meeting with representatives of Amtrak and the Department of Transportation about the stabilization project at the escarpment. The project, which was intended to culminate with the application of shotcrete to the rock face below Promenade Hill and Hudson Terrace, was undertaken without the required review by the Department of State and was terminated by a stop-work order issued on July 28 but not enforced until August 5. According to information received, the meeting on Tuesday is intended "to give the community the opportunity to learn more about proposed alternatives for the project." Affordable Housing Hudson is holding a forum about the proliferation of buildings being used for short-term rentals in Hudson. The forum is called, "Airbnb: Who are you and what are you doing to my city?" A panel of two has been announced: Bill McKenna, town supervisor for Woodstock, "who will speak on the effects of Airbnb on community life and the initiatives he has taken to control and shape how Airbnb is allowed to do business in his town"; and Michael O'Hara, First Ward alderman, who will "report on research into resolutions that can help Hudson follow in the footsteps of other cities around the nation that have been proactive in protecting affordable housing and workforce housing." The forum was originally scheduled to take place at 5:30 p.m. at the Chamber of Commerce, 1 North Front Street. Last week, Gossips was informed that it was going to be moved to a larger venue, but as of this morning, a change of venue has not been confirmed nor a new venue announced. Update: Apparently not only the place but the time has changed. It is now being announced that the forum "Airbnb: Who are you and what are you doing to my city?" will take place at 6:30 p.m. at the Hudson Youth Center, 18 South Third Street. The forum is being hosted by Michael Chameides and John Kane. The informal Common Council meeting this month, which took place on Monday, September 10, took a record-breaking (record-breaking for its brevity) nine minutes. The regular Council meeting, on Tuesday, September 19, was almost as short, adjourning after only fourteen minutes. In that time, a couple of things of interest were accomplished. First, the Common Council passed a resolution authorizing the mayor to execute a letter of agreement with GAR Associates, LLC, to delay the citywide revaluation. The reval has supposed to be happening right now with the goal of having the reassessments finalized by July 2018, but since Cheryl Kaszluga, the City assessor, resigned a few months ago, the work is being postponed "until the City has a new Assessor in place and the new Assessor is fully ramped up." The plan is to postpone the revaluation for one year, which would mean that the final revaluated tax roll would be completed by July 1, 2019, for the 2019-2020 tax year. 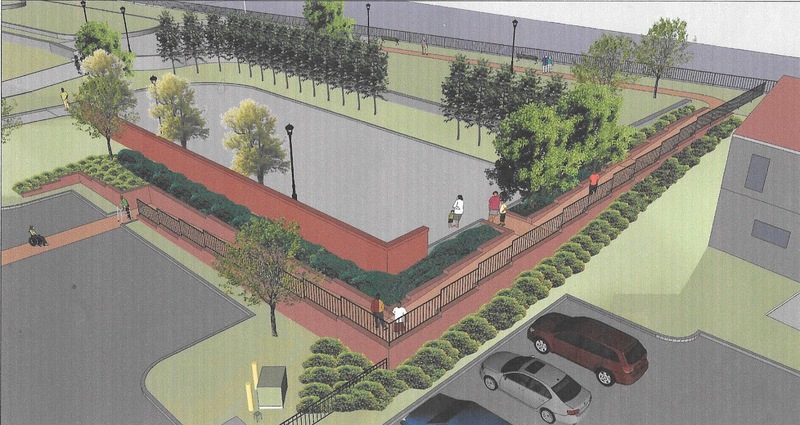 Also of interest, the Council passed a resolution authorizing the mayor to execute a contract with Tighe & Bond to create the engineering drawings for the ramp to be constructed at Promenade Hill. Tighe & Bond submitted the lowest bid for the work, which was $30,951. The funding for the ramp has been an interesting journey. 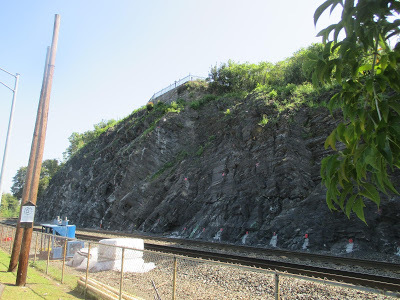 The City twice--in 2011 and 2015--applied for grant funding to make improvements to Promenade Hill, which would have included a ramp to provide universal access to the park and its views. Both efforts were unsuccessful. In 2014, Alderman Tiffany Garriga (Second Ward) insisted that $20,000 be written into the 2015 budget to install a temporary ramp if Hudson's 2015 grant efforts were unsuccessful. 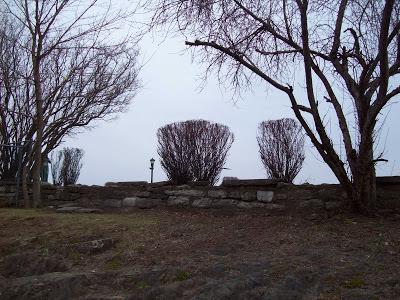 In the spring of 2016, when it seemed likely that Hudson's most historic park would be defaced by some kind of temporary ramp, purchased with the allocated $20,000, the Mrs. Greenthumbs Hedge Fund stepped in and hired Barbara Restaino to design a proper ramp. The design had been paid for, but building the ramp was going to cost $170,000, and the City only had $20,000 set aside for that purpose. By mid-summer 2017, $120,000 had been set aside for the ramp, but $50,000 was still lacking. Once again it was Garriga who brought up the subject of the ramp. On July, the Council passed a resolution requesting a progress report from the mayor about the ramp. That report was submitted prior to the August meeting, and at that meeting, the Council passed a resolution taking another $50,000 from the fund balance to pay for the ramp. 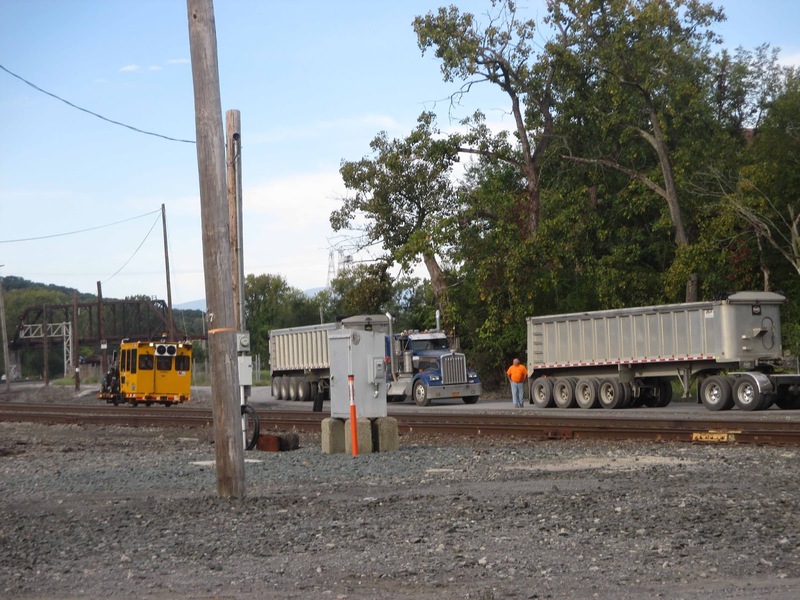 With $170,000 now in place--none of it coming from grants, all of it coming from the City of Hudson budget and fund balance--work on the ramp is ready to begin. The first step is creating the engineering drawings. Now that fall has begun, the actual preparation of the site and construction of the ramp will probably not begin until spring. Rick Rector, the only official candidate for mayor of Hudson, endorsed by the Democrats, the Republicans, and the Conservative Party, has announced a series of five "conversational meetings"--one in each ward--to take place in October, in the run up to Election Day on November 7. Rector describes each proposed meeting as "a meet, greet, visit and a great opportunity to get to know each other better," adding "I look forward to hearing your thoughts on our community and sharing mine with you." The date and place for each meeting is listed below. Every meeting is scheduled to begin at 6 p.m. and continue until 7:30 p.m.
On August 25, the City of Hudson filed an Article 78 lawsuit against the Greenport Planning Board, A. Colarusso & Sons, and Holcim US "to annul, vacate, and set aside the July 25, 2017 approval by respondent Town of Greenport Planning Board (hereinafter 'Planning Board') of a 'Negative Declaration' under the State Environmental Quality Review Act, ECL Article 8 ('SEQR'), for the proposed widening, relocation, and improvement of an existing 2.33 +/- mile long truck 'Haul Road' (hereinafter 'the Project') by respondents A. Colarusso and Son, Inc. and Colarusso Ventures, LLC (hereinafter collectively "Applicant" or "Colarusso"), and for an order requiring the Planning Board to adopt a 'positive declaration' under SEQR and to require the preparation of an environmental impact statement ('EIS') for the Project." 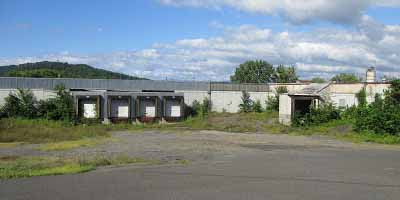 (1) vacating and annulling the determination of Respondents CITY OF HUDSON AND CITY OF HUDSON PLANNING BOARD to conduct an unlawful SEQRA review of certain repairs that Petitioners/Plaintiffs have already performed to their commercial dock; (2) prohibiting Respondents CITY OF HUDSON AND CITY OF HUDSON PLANNING BOARD from imposing excessive fees on Petitioners/Plaintiffs in connection with Respondents' review of these dock repairs; (3) prohibiting Respondents CITY OF HUDSON AND CITY OF HUDSON PLANNING BOARD from imposing excessive fees on Plaintiffs/Petitioners in connection with Respondents' review of Petitioners/Plaintiffs' application to resurface their haul road; (4) prohibiting Respondents CITY OF HUDSON AND CITY OF HUDSON PLANNING BOARD from further regulating the intensity of Petitioners' use of their commercial dock and haul road; (5) vacating and annulling the determination of Respondents CITY OF HUDSON and HUDSON COMMUNITY DEVELOPMENT AND PLANNING AGENCY that Petitioners/Plaintiffs require a development permit pursuant to Chapter 148 of the Code of the City of Hudson before they may resurface this haul road; and (6) granting such other and further relief as the Court deems just and proper. Paul A. Colarusso, president of A. Colarusso & Sons, announced the company's countersuit yesterday in a meeting with the editorial board of Columbia-Greene Media, a.k.a. the Register-Star. That meeting was videotaped and can be viewed here. At the beginning of the video, Colarusso, responding to a question from Register-Star reporter Amanda Purcell, indicates that the countersuit is "about the SEQR process previously done on the dock repair project." He goes on to say, "The City of Hudson Planning Board wants to redo SEQR on the dock, and we feel that is not appropriate, and our lawyers feel it is not appropriate." He acknowledges that "there's other stuff in there," but the SEQR issue is the reason for the countersuit. 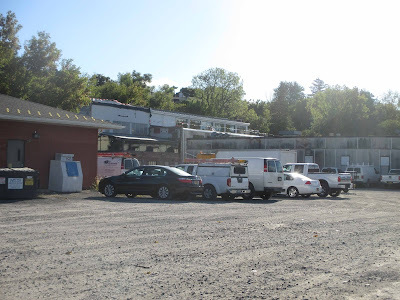 The City of Hudson wants the Greenport Planning Board's negative declaration in SEQR to be annulled, vacated, and set aside, arguing that the Greenport Planning Board "failed to take a hard look at the potential significant adverse environmental impacts of the Project." According to Colarusso, the reason for the countersuit is to prevent the Hudson Planning Board from redoing SEQR on the dock repair project--a project that was completed toward the end of 2016. Gossips is unaware of any plan to redo the SEQR on the dock beyond a comment made by Mitch Khosrova, counsel to the Hudson Planning Board, at the board's last meeting, during a discussion of the quantitative data--traffic volume and noise levels--that is needed for the board to consider Colarusso's application for a conditional use permit for its dock operation. (The need for a conditional use permit for the dock operation, previously a nonconforming use, was triggered by the repairs made to the dock.) In the context of advising the board about its right to have the information it seeks and the possible consequences should the applicant continue not to provide it, Khosrova said--or at least it is so recorded in my notes from the meeting--"You have to do SEQR for the dock." Could it be that this comment prompted the lawsuit? Then there's the issue of the previous SEQR. Later on in the video (starting at 2:59), Colarusso clarifies that SEQR was done on the dock project with the Department of Environmental Conservation (DEC) as lead agency. He alleges that the City of Hudson was notified of the project--not by Colarusso but by DEC--and the City "chose not to be an involved agency." If what Colarusso says is true, one wonders when and how this happened. The first time Gossips reported on the dock project was in November 2015, when the application submitted to DEC by Colarusso on October 15, 2015, was discussed at an informal Common Council meeting. At that point, the review by the Army Corps of Engineers was already underway, as evidenced by the fact the the Council had received a copy of a letter, dated September 9, 2015, from the ACE requesting more information from the applicant, and a DEC public comment period was about to end, suggesting that DEC was then doing SEQR. 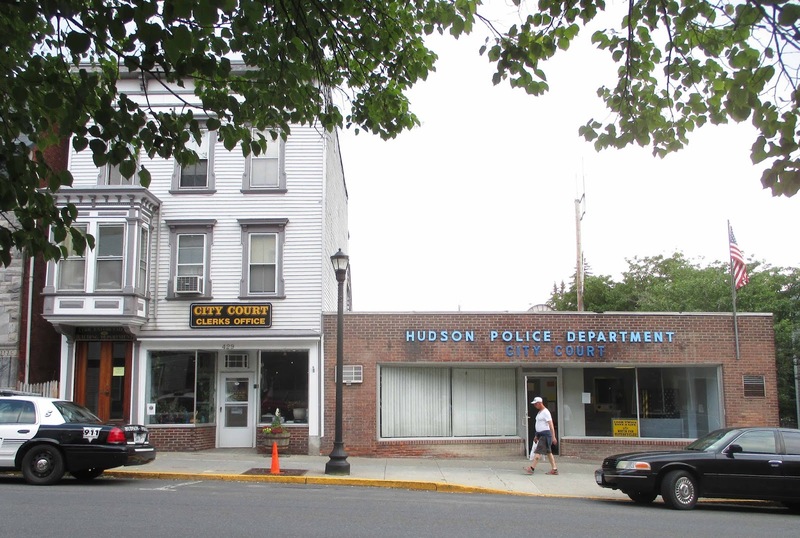 If the City of Hudson did indeed deliberately opt out of its role as involved agency, it is not clear when or how or by whom the decision was made. 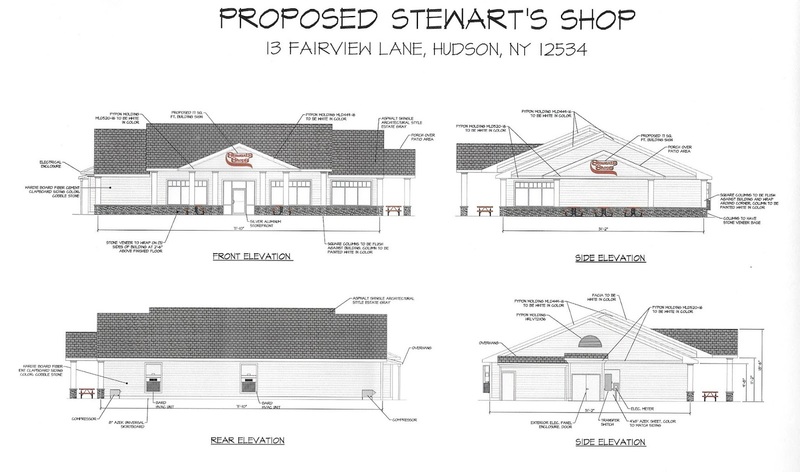 At that time, in November 2015, when asked if the Common Council intended to make a comment during the public comment period on behalf of the residents of Hudson, Don Moore, then Common Council president, said the review was taking place at the state level and indicated that the Planning Board would be the agency of city government that would have jurisdiction in the matter. Ten months later, in August 2016, when the Council received a copy of another letter from the ACE, dated July 18, 2016, which made reference to "the need to obtain any other Federal, State or local authorization required by law for the proposed work," Alderman John Friedman (Third Ward) wanted to know what permits from the City were required. Friedman's question, directed to Council president Claudia DeStefano, went unanswered, but on January 27, 2017, Mayor Tiffany Martin Hamilton announced that the Code Enforcement Office had issued an Order to Remedy (ORT) to Colarusso for the dock because they had failed to seek approval from the Planning Board for the repair project. 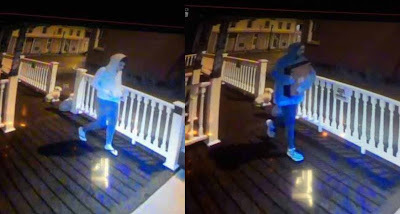 At about 1:30 p.m., Gossips updated the original post about the early morning burglaries at Nolita, Governor's Tavern, and Wm. Farmer and Sons to report that the suspects were in custody. (For some reason, Wm. 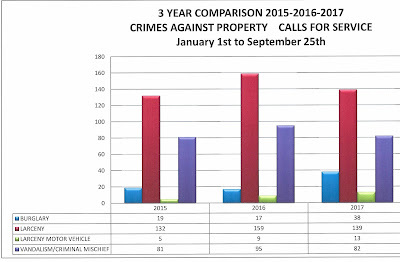 Farmer and Sons, which was reported earlier to have been burglarized, is not mentioned in the most recent report.) Bill Williams at 98.5 The Cat is now reporting the identities of the two people who have been arrested for the burglaries: "Two women charged with Hudson break-ins." The Register-Star just reported that Paul A. Colarusso, in a meeting with the Register-Star today, announced that the company is countersuing the City of Hudson, the Hudson Planning Board, and Hudson Development & Planning Agency. The story is reported by Amanda Purcell: "A. Colarusso and Son announce countersuit against Hudson." 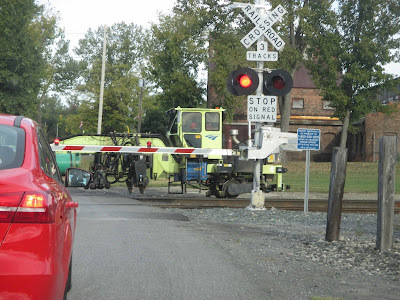 This morning, shortly before 9 a.m., a parade of railroad equipment heading north caused a traffic jam at the Broad Street crossing. In the few minutes it took for the ten or so pieces of equipment to pass, the line-up of vehicles waiting to cross the railroad tracks included two Colarusso dump trucks heading for the dock and two heading out from the dock. Three Hudson businesses were burglarized between 1 and 6 a.m. today: Nolita, Governer's Tavern, and Wm. Farmer and Sons. The images of the suspects--two women--were captured by a surveillance camera. The woman in the image at the right is clutching a stolen cash register. Amanda Purcell has the story in today's Register-Star: "Police seek public's help in identifying suspects in burglaries at 3 businesses." Update: The Hudson Police Department is reporting on Facebook that the two suspects are now in custody. It's been a while since I've mined issues of the Hudson Evening Register from 1917 for hints of what life was like in Hudson during World War I. Recently, I returned to the task. The following news item, which appeared on the front page of the paper on August 30, 1917, has nothing do to with the war, but I couldn't resist sharing it. It deals with the sort of problem we still struggle with today, but the solution is achieved in a manner a bit different from what might happen now. Next week, the Hudson City School District is hosting two big events--or one big event in two parts. On Wednesday, September 27, at 6:30 p.m., it's the closing ceremony and the annual homecoming bonfire at Barrett Field (behind Montgomery C. Smith School, 102 Harry Howard Avenue). On Thursday, September 28, at 6:30 p.m., it's the grand opening and dedication of the new Bluehawk Sports Complex (behind the Hudson Jr./Sr. High School, 215 Harry Howard Avenue). You can learn more about the festivities being planned by clicking here. 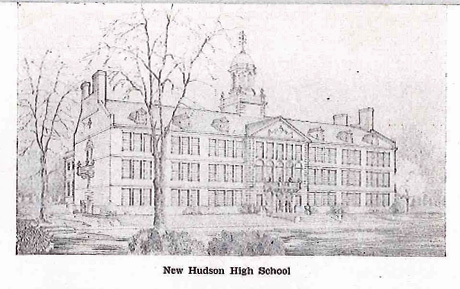 The program includes this picture of 102 Harry Howard Avenue, identified simply as "New Hudson High School." It must have been an architect's drawing of the building because construction did not begin until 1936. Here's what the program had to say about the site where there was an athletic field even before there was a school building. 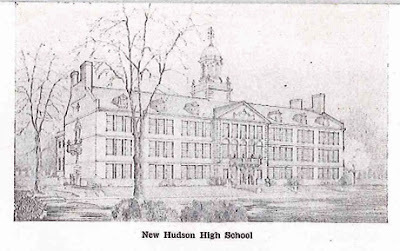 In 1931, the Board of Education of the City of Hudson took title to a 28-acre tract of land situated on Harry Howard Avenue and extending easterly to Oakwood Boulevard, as a site for the location of a new junior-senior high school and a general school recreation center. The plans for a high school building have been approved, and it is expected work on the construction of the building will be commenced soon. The plans for the development of this property are the work of leading authorities. Tooker and Marsh, one of the most prominent firms of school architects, have drawn the plans for the building, and the development of the field and play areas is the work of Dr. Laurie D. Cox, head of the Department of Landscape Engineering, State College of Forestry. Nearly all of the facilities that are usually found in complete "civic centers" will be included in this project. The recreation and play field is already completed. This includes a baseball diamond, football and soccer field, a quarter-mile running track, five tennis courts, ample play grounds for smaller children, park areas with drives, walks, etc. A swimming pool and "outdoor theatre" are included in the complete plans and will be built later. The entire area lends itself naturally and easily to beautiful landscaping effects. The opinion of authorities is that for accessibility, natural contour and beauty and adaptability to education and recreation use the property is ideal. So far as I know, the swimming pool and outdoor theater were never built, and eighty-two years later, Hudson is moving on up the street to the artificial turf and gorgeous views of the new Bluehawk Sports Complex.